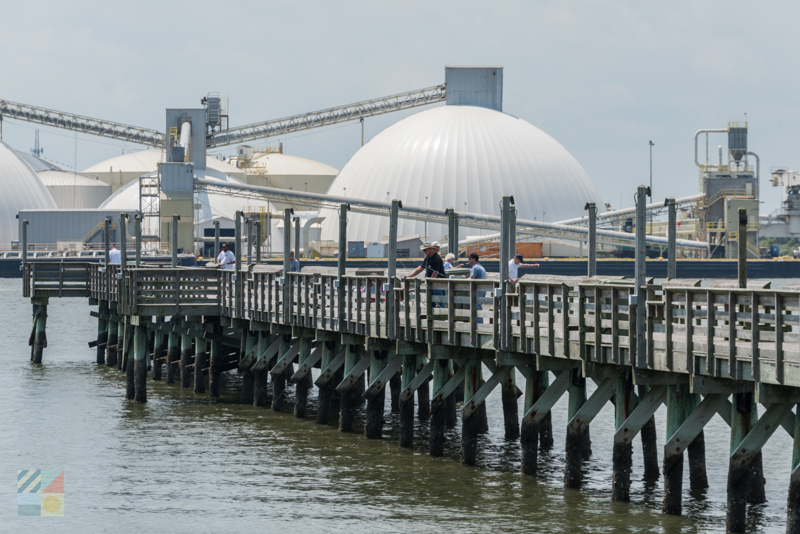 Visitors cruising along US Highway 70 in between the towns of Morehead City and Beaufort will briefly travel over a small parcel of land that makes a momentary appearance in between the two on-the-water bridges. This small slip of terrain is known as Radio Island, and it’s certainly more than meets the eye. 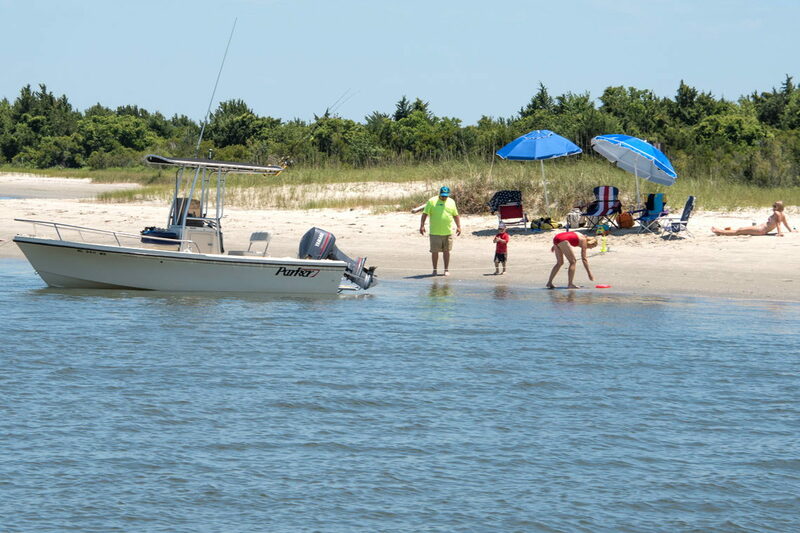 Home to a yacht club, several marinas, a scenic beach, a fishing pier, and multiple boat or kayak launching areas, Radio Island offers visitors a surprisingly large number of things to do while being relatively “close to home” for Morehead City or Beaufort vacationers and locals. Definitely worth a second look, Radio Island is a unique component of the Crystal Coast landscape, and is worthy of exploration in more ways than one. As it turns out, this unusual moniker wasn’t always this region’s namesake, and the area originated as the blander, but arguably more accurate, Inlet Island. The new radio station was a big deal to locals, as it was the first radio station in Carteret County, and was well known for its clear reception and surprisingly long range, thanks to the aforementioned tower. The station remained in operation well after the “Golden Age of Radio” was over, and was eventually sold and moved in the late 1960s / early 1970s. Today, the iconic radio station is long gone with the exception of a small flag on Old Causeway Road that marks its former home, however, the island has enjoyed recent development in the form of the aptly named Radio Island Marina, and the relatively new Olde Town Yacht Club. Today, while Radio Island hasn’t grown much more in its roughly 80 years of existence, the isle is still a popular destination for mariners, anglers, and any visitor who appreciates a quick waterfront that’s just barely off the beaten path. Radio Island has a number of attractions for visitors who appreciate the great outdoors. Newcomers and explorers will want to swing by these Radio Island destinations that are locally known as fine spots for enjoying a full day of fun in the sun, or on the water. Radio Island is home to one of the largest public boat ramps and piers in the area, the Newport River Boat Ramp. This site is found almost directly off the main highway at 301 Highway 70, and takes up almost the entirety of the northwest corner of Radio Island. The expansive area features parking for 56 vehicles with trailers, public restrooms, and six boat launches that can accommodate vessels of varying sizes. From this site, visitors can directly reach the Newport River, as well as the Back Sound, the Bogue Sound, and other waters in and around the Crystal Coast region. In addition, the Newport River Boat Ramp has a 575’ ft. long fishing pier that extends into the heart of the river, and which is a popular destination for local anglers. Another enticing site on Radio Island is the public beach access which is located on the edge of the Bulkhead Channel, which borders the Bogue Sound. 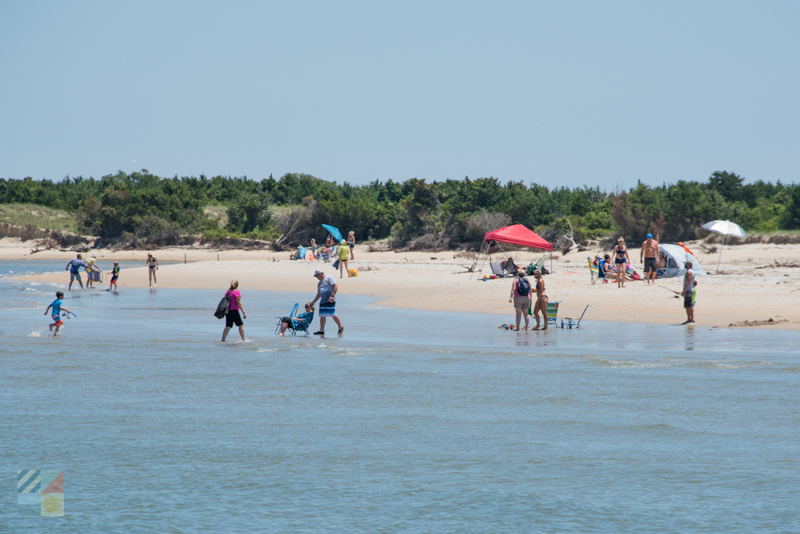 Located on the southern edge of the island, and managed by the Carteret County Parks and Recreation department, this destination is an almost secretive spot for some convenient fun in the sun. The beach features nice and gentle waves that are ideal for young visitors, and which serve as fine grounds for fishing, kayaking, stand-up paddleboarding, and other sports that require calm and shallow waters. The beach is also nicely wide and sandy, and the site features parking, restrooms, seasonal showers, and handicapped accessible facilities via a long wooden boardwalk that leads directly to the sand. There are a set of rules for visiting the beach, (such as no fireworks, beach fires, or glass containers), which are stationed at the beach’s entrance. Slightly hidden, this beach access can be a little tricky to find for newcomers, but is a welcome destination for sunny days on the sand. This relatively new addition to the Crystal Coast landscape is becoming a popular destination for vacationers who want to enjoy a stay on the water. The complex features an array of condominiums which can be rented by area vacation rental companies, as well as beach access, a swimming pool and spa, a fitness center, a poolside pavilion with grills, and an on-site marina. Open to short and long term visitors alike – by boat or by land – this yacht club and marina has quickly become an enticing place to stay that’s seemingly in the middle of isolated Radio Island, but which is close to all the top attractions of Beaufort and Morehead City. Radio Island is easy to reach, but visitors will want to pay attention to find the “exit” to this destination. Turn south on Marine Road in between the towns of Morehead City and Beaufort on US Highway 70 to access the heart of the island. The public beach access is located off of Olde Towne Yacht Club Drive, (not to be confused with the adjacent Olde Towne Yacht Club Road.) There are no convenience or beach stores nearby, so be sure and bring along everything required for a day at the beach. 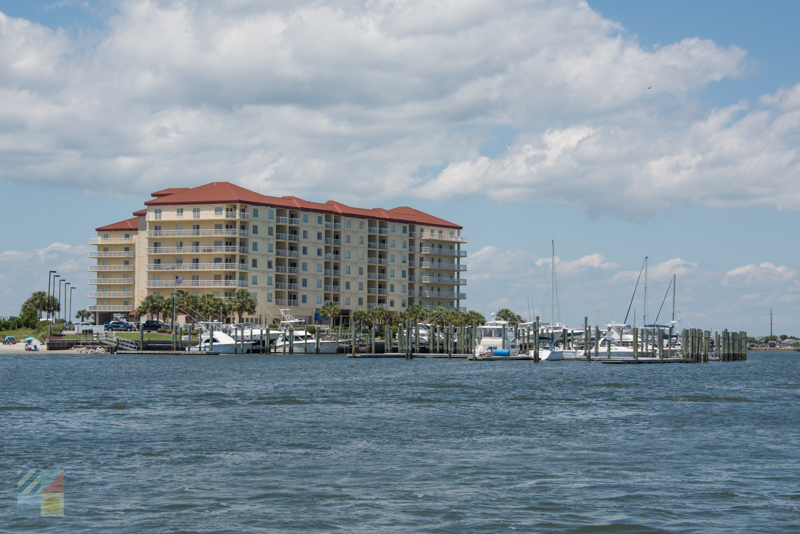 Accommodations on Radio Island, and specifically at the Olde Towne Yacht Club, are available through multiple property management companies in the area. Search for vacation rentals in Beaufort / Morehead City to find area condos. The public beach access is ideal for kayaking, but visitors will want to use caution when entering the Bulkhead Channel, which can attract vessels of all sizes. Stick close to the shore, and watch for windy days when the local currents can be deceptively swift. Radio Island is a bit of a hidden gem destination along the Crystal Coast. Barely visible and seldom discovered by vacationers, the relatively “new” island is nonetheless a neat place to explore, or to enjoy a lazy afternoon on the sand. Found just off the main drag, and featuring a unique history that shaped an equally unique landscape, Radio Island is definitely worth a trip for any visitor who wants to fully discover the Crystal Coast.